You play as a commander of some pirate ship. 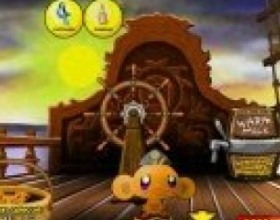 Your task is to take control over seven seas. 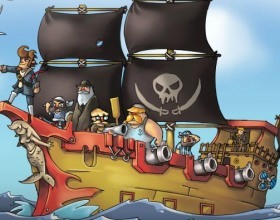 Manage resources, hire crews, invade other ships, collect gold and do a lot of things in this pirate adventure game. Don't forget to repair and upgrade your ship regularly. Rafting is something everyone should try at least once in your life. 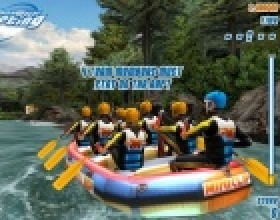 Sit in your raft and drive the most rapid rivers in the world with your team-mates. Do not let your friends go overboard. Press X when driving down the waterfall. Use Arrows left and right to steer. Press arrow down to slow down. Climb back in the boat pressing X. 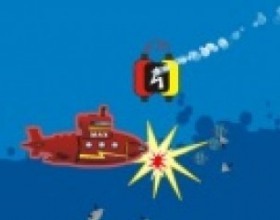 Take control over your submarine and dive deep into ocean. 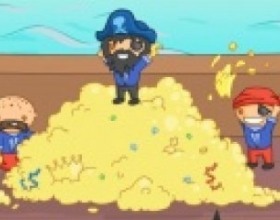 Collect gold and find new ocean creatures. Destroy any creatures that are treating you like an enemy. Take an eye on your fuel level. After each level purchase different upgrades. Use your mouse to control the game. 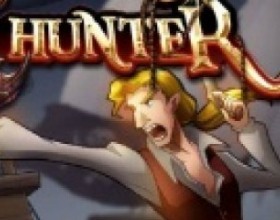 You play as unbeatable pirate hunter and your task is to clear the seas from those blood-thirsty criminals. 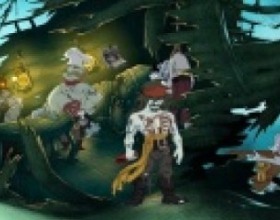 Jump on pirate ship and kill everyone who stands in your way. Use W A S D to move (tap twice to run). J - attack or pick up item. K - jump. L - shoot. J K - special attack. 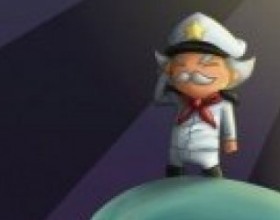 Your task is to take control over big seas by attacking and destroying other ships. 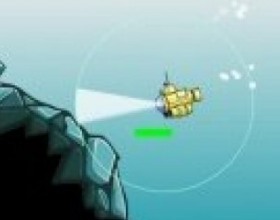 Pick up treasures from wrecked enemy ships and buy cool upgrades for your own ship. Grow bigger and more powerful. 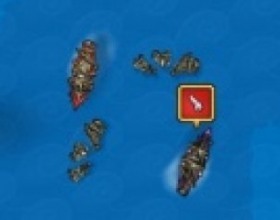 Use Arrows or W A S D to move your ship. Press Space to attack. 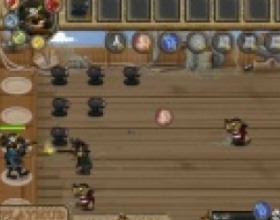 Your mission is to help your pirate to eliminate all soldiers from the building. To do that you can use your cannon on your ship. Use your Mouse to aim and fire. Use minimal number of cannon for a better score. Your task is to guide pirates through the map to get more treasure. Your pirates really love gold. 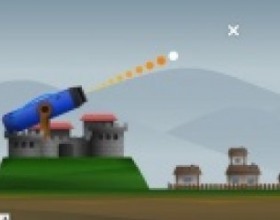 Place oil rigs to earn enough resources and be able to buy weapons and cannons. Protect your treasure from attacking monsters. Use mouse to control the game. Press Space to speed up the game. You are a commander of a giant space ship. Your mission is protect your space conquered areas and destroy all invaders. Use Mouse to control this game. Destroy enemy base to proceed to next level. Evil whale is back again. Your task is still the same - bring chaos into the ocean waters. 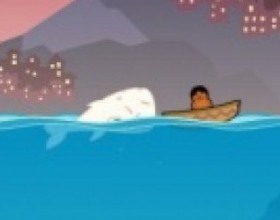 Destroy boats, eat people and other fish. You must avoid nets and harpoon fire. Use Mouse to move and click to use boost. Press Space to open upgrade menu. 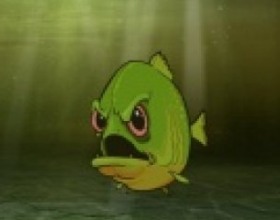 In this bloody game you play as a piranha. Your task is to eat people and collect blood from them to open new upgrades. Sink down ships to get people into the water. 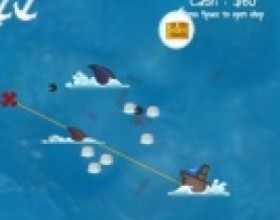 Use Mouse to control your deadly fish and attack. Aim of the game is simple - destroy everything around you. You're controlling blue base, ships and fighters. Your mission is to destroy all red units. Use Mouse to control the game. Follow game hints and instructions to get to know which structures place first. Now you play as an immortal pirate. Your task is to travel around underwater land and solve various things regarding to your ship crash 15 years ago. Use Mouse to point and click on objects. Click on the treasure chest to select items and use them. 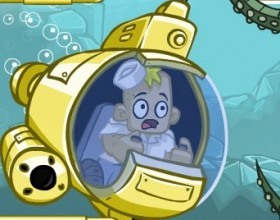 Your task is to control your submarine, upgrade it all the time so it will become really unstoppable machine. After each go you'll earn some money for upgrades. Use Up and Down Arrows to move. Press Space to shoot. Your task is to find various parts of your spaceship in order to rebuild it and fly back home. 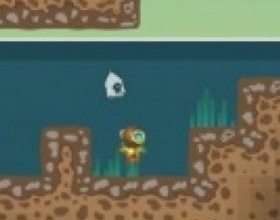 Dive deep, dig hard to find all resources for your spaceship. Keep your suit pressure, battery and oxygen levels stable all the time. Buy upgrades. Use W A S D to move. Select items with 1-6. Click to use active item. Press H to see help menu and all other instructions. Use only your Mouse to control your ship. You must fight against sharks and pirates in order to survive. Collect treasure measures and upgrade your ship to be able to fight back your enemies. Shooting is automatic so just move your mouse. Press Space to open store. 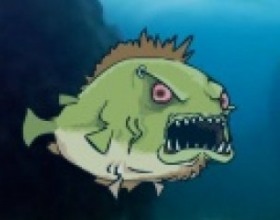 Are you afraid of piranhas? 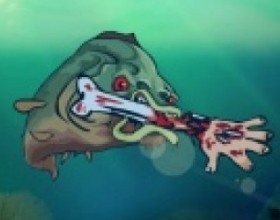 Now you can play as one of these killer fishes. Your mission is to eat everyone who gets in your way. Jump out of the water and attack boats to get people in the water to feed yourself. 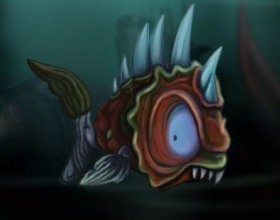 Use gained blood to create a piranha army and upgrade yourself. Use mouse to control the game. Another great cannon game. 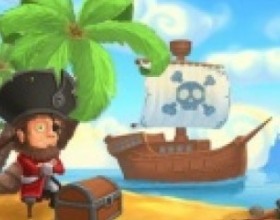 Use your cannon to destroy enemy ships that are trying to destroy your sand castle. Collect coins to buy new powerful defence tools and save your kingdom. Use Mouse to aim and fire. Use 1-6 numbers to switch weapons. Use Arrows Left and Right to switch between views. Your mission is to stop attacking pirates from taking your treasure. 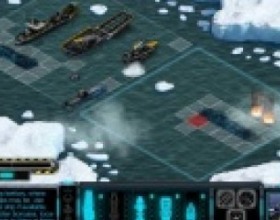 Place your defence units and move your commander to kill your enemies before they kill you. Use Mouse to play this game. Follow game tutorial to learn how to play this game. Your task is to collect all flying astronauts and return to your base before oxygen and fuel runs out. 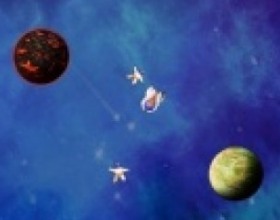 Many environment objects as planets and meteors will help you or trying to stop you. Use Arrow keys, to control your space ship. Ships are one of the most strategically important means of cargo and passengers transportation. They represent a whole and separate industry. The construction and models of ships vary greatly and can be quite interesting for those who are interested in technical background of such things. So the gamer can choose the type of ship (for cargo or passenger purposes, or for the military use). If this is the cargo or passenger ship, the gamer, as a rule, has to deliver them to the given destination as quickly as possible and at the lowest expenses of fuel and money, as there are a lot of opponents with which he has to compete. Thus the victory is gained if the rivals are outstripped in terms of speed and cost. This subgenre requires basic skills for planning, organizing, scheduling, etc. and is frequently time-limited. 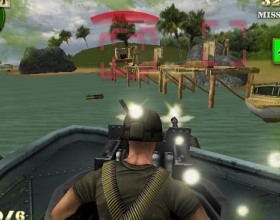 Military ships are used in war games, actions, fighting, etc. 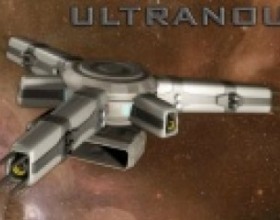 The gamer can choose whatever type of ship he considers the most effective for the military purposes. Here, good technical characteristics contribute very much to the successful proceeding. 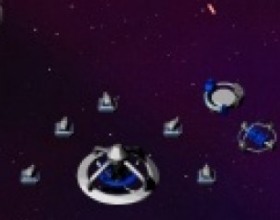 With more and more battles won the player can create his own powerful marine consisting of a large number of ships. 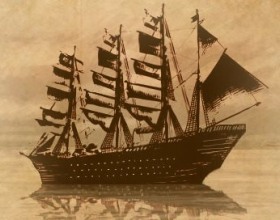 Ships are frequently involved into adventure games. It is very exciting to travel seas and explore vast new territories. 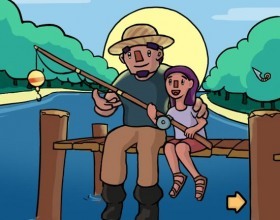 The gamer can choose a role of a pirate, an adventurer, naval soldier, etc. Each role demands achieving different end goals. For example, the pirate must fight against the authorities and search for treasure, while the Navy has to defend its country’s terrains and inhabitants of the pirates’ attacks. Also, ship racing games are available when the player has to participate in ship racing that takes place on sea, rivers, canals, etc. Thus, the quicker his ship, the more victories he can gain. Ship parking games are quite popular. 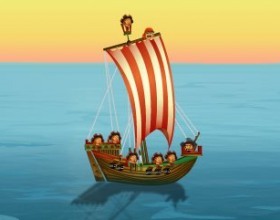 Here, the player is going to park his ship in the harbor avoiding many obstacles, both visible and hidden on his way. This subgenre usually has time restrictions. Therefore, the game proceeding is quite complicated as there are many ships already parked in the harbor and a lot of obstacles appear quite unexpectedly. So the gamer must react quickly enough to avoid the danger of crashing into the other ship. Naturally, ship games are available online in indeed great quantities. 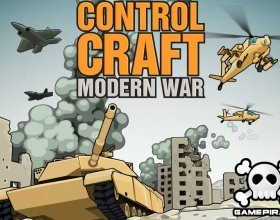 They can be also multiplayer, that means that several gamers can play simultaneously.